Friends and fellow Springfield Housing Authority employees gathered recently to bid farewell to Human Services Director Kathy Hardy, on her retirement. 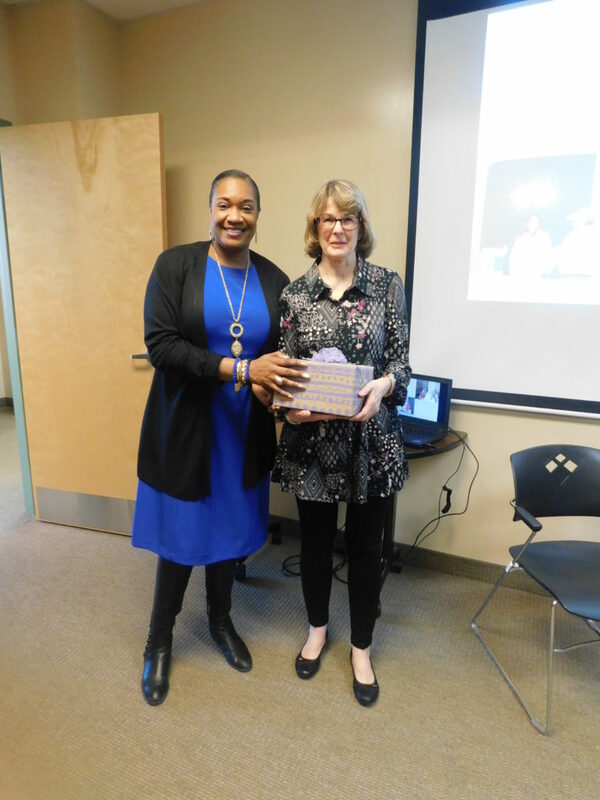 The luncheon event at 60 Congress St. featured a tasty lunch, cake and cookies, and many accolades for the woman who presided over hiring, training, negotiating, certifying, and all of the duties associated with an HR department. SHA Executive Director Denise Jordan with retiring Human Resources Director Kathy Hardy. Hardy plans to spend her time golfing, hanging out with family and friends, and doing what retired people do. The farewell drew a good portion of SHA’s employee roster, and garnered high praise for Hardy, whose husband John was also in attendance. Remarks on her tenure reflected friendship, respect and love. “You’ve been so great to work with. 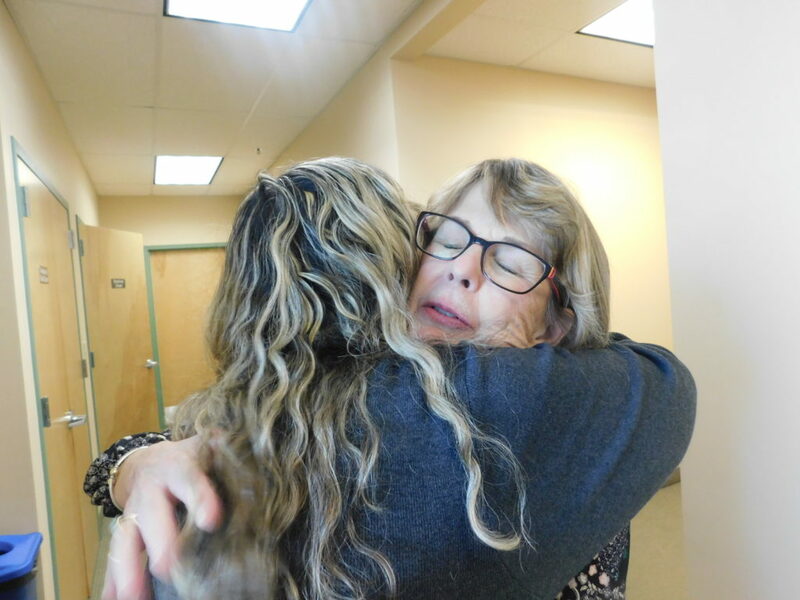 My only regret is that I was able to work with you just six months,” said Executive Director Denise Jordan. 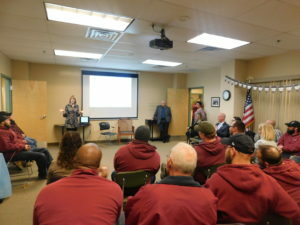 Retiring HR Director Kathy Hardy thanks SHA employees, and says goodbye, after 10 years on the job. Hardy was known to perform tasks and jump in even outside of her job description. She was a liaison to the SHA partnership with the Hampden County Sherriff’s Office, sat on the board at the non-profit social service agency The Gray House in the North End. She also mentored children over her years as a Springfield School Volunteer. 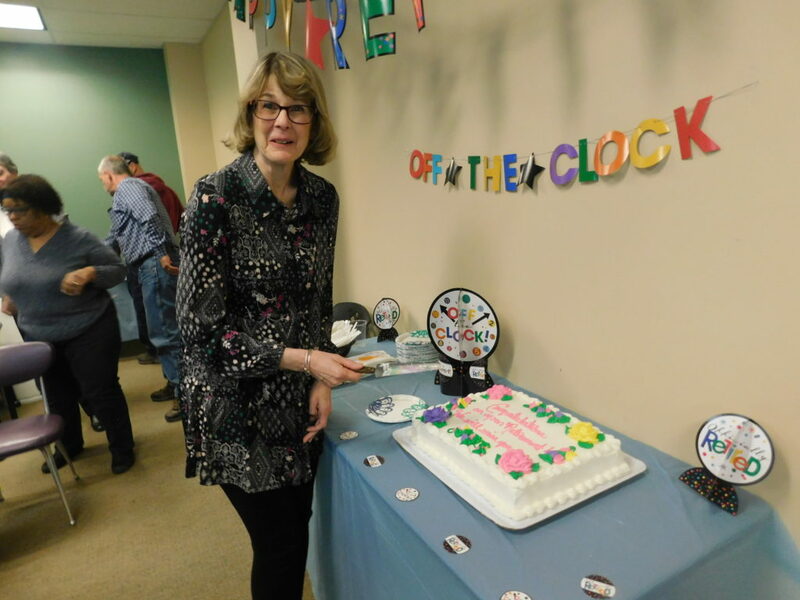 Kathy Hardy cuts the cake at her retirement party. 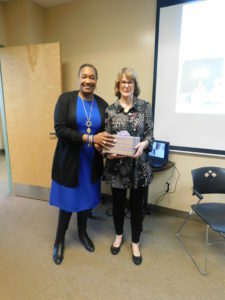 Teresa Liberti, Executive Director at The Gray House, attended and thanked Hardy for her volunteer work there. SHA Board of Commissioners Chairman Thomas LaBonte attended, also praising Hardy for her work ethic and friendly personality. “She’s always available and willing to help no matter what we need. She’s done a great job, and she leaves us in great shape. We wish her the best,” he said.